Product #46897 | SKU FSA90701 | 0.0 (no ratings yet) Thanks for your rating! This Nikon 1 SB-N5 Speedlight for V Cameras is designed for use with the Nikon V CX format mirror-less cameras. The SB-N5 mounts to the V camera's multi-accessory port and is powered by the camera--no batteries required. This convenient featherweight (70 g) flash has a guide number of 8.5 m at ISO 100 and is i-TTL compatible. Exposure modes include Fill Flash, Front- and Rear-Curtain sync and slow-sync and flash compensation. The effective flash range is 2 to 66 feet, depending on ISO, bounce angle, and aperture, and the head both tilts up 90° and swivels 180° to both right and left. Flash duration is 1/4000 second at full power. Electronic construction consists of Automatic Insulated Gate Bipolar Transistor (IGBT) and series circuitry. A capture illuminator lights for six seconds using Smart Photo Selector and Motion Snapshot modes. And, yes, there is a flash-ready indicator. 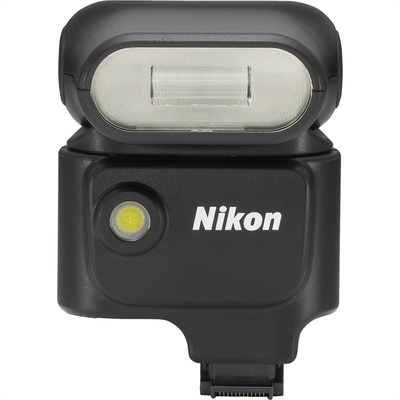 When you need more light, or are looking to add a creative touch to illumination, use the new Nikon 1 Speedlight. Plug this compact i-TTL compatible flash unit into the camera's multi-accessory hot shoe. Angle the flash up, down, left or right and bounce light to precise advantage. The flash can double as a continuous light source illuminating for six seconds during both Motion Snapshot and Smart Photo Selector modes. Extra batteries not required-the camera powers the SB-N5 Speedlight.